Smart Energy: How to Measure It, How to Manage It « Adafruit Industries – Makers, hackers, artists, designers and engineers! 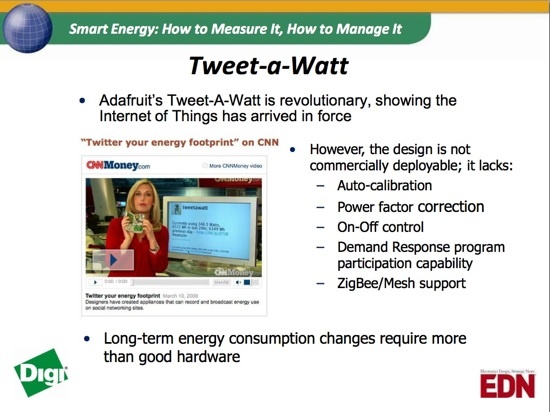 Tweet-a-watt got some slide action on EDN’s “Smart Energy: How to Measure It, How to Manage It”… – via Twitter. 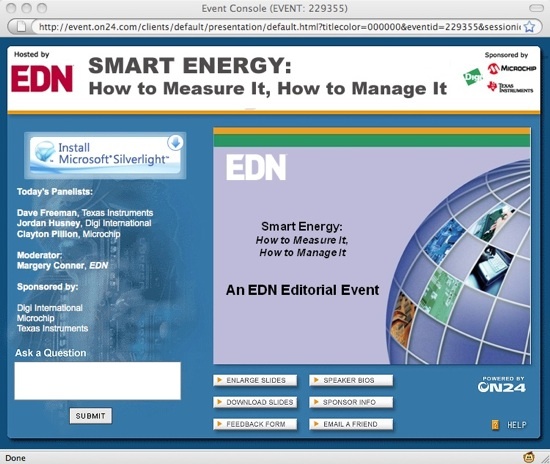 Smart Energy: How to Measure It, How to Manage It. Smart energy meters for the smart grid are just one example of how important it will be to measure power usage at the application. Alternative energy sources like solar and wind require power metering, and so do car charging ports for tomorrow electric vehicles and plug-in hybrids. In addition, server farms will need to be able power usage at the server rack level to accurately charge their customers for server power costs. All of these come back to smart energy ICs that can measure and communicate power usage. EDN technical editor Margery Conner will host a webinar panel discussion on August 24th featuring senior industry experts in key aspects of Smart Energy. PDF slides here.